Limited License to Use Site. All materials on this Site—including, for example, all of the images, photographs, illustrations, text, product descriptions, formats, logos, designs, icons, programs, and video or audio clips (collectively, the "Contents")— are intended solely for personal, non-commercial use. Toppik retains all rights to copyrighted materials, trademarks, brand names, product formulas, logos, labels and packaging available and displayed on the Site. You are granted a limited, non-exclusive and revocable license to access and make personal use of this Site. This license does not include any resale or commercial use of the Site or Contents; any collection and use of any product listings, descriptions, or prices; any derivative use of the Site or Contents; any downloading or copying of account information for the benefit of another merchant; or any use of data mining, robots, or similar data gathering and extraction tools. This site or any portion of this site may not be reproduced, duplicated, copied, sold, resold, visited, or otherwise exploited for any commercial purpose without the express written consent of Toppik. You may not frame or utilize framing techniques to enclose any trademark, logo, or other proprietary information (including images, text, page layout, or form) of ours or our affiliates without our express written consent. You may not use any meta tags, meta names or any other "hidden text" utilizing the name or trademarks of Toppik or our affiliates without the express written consent of Toppik. Any unauthorized, improper and/or illegal use of the Site or any Contents will result in the termination of your license to use the Site. Copyright Protection. All Content appearing on the Site, including the site design, graphics, logos, icons, photographs, images, and audio and video clips, as well as the selection, assembly and arrangement thereof, and all software are the property of Toppik and are protected by U.S. and international copyright laws. All other copyrighted materials are the property of their respective owners. The Content on the Site may be used by you as an educational or information resource. Any other use, including downloading, uploading, copying, reproducing, modifying, distributing, transmitting, republishing, displaying, creating derivative works of, or performance of the Content is strictly prohibited. You may not provide links to images or text on our Site for commercial purposes without our express written consent. Upon request that you remove any link to the Site, you must immediately remove such link. If you wish to obtain permission to reprint or reproduce any materials appearing on our Site, or use a link to our Site for commercial purposes, you may contact us at support@toppik.com. We reserve the right, in our sole discretion, to condition or refuse to consent to the use of any or all of the Content at any time and in any manner. All rights not expressly granted herein are reserved. Trademarks. Unless otherwise specified, “Toppik,” the Toppik logo, all product names, slogans and other logos are trademarks, or trade names ("Marks") of Toppik and/or Spencer Forrest, Inc. All other Marks are the property of their respective owners. The use of any of our Marks without our express written consent is strictly prohibited. Your access to this web site should not be construed as granting, by implication, estopppel or otherwise, any license or right to use any Marks appearing on the web site without the prior written consent of Toppik or the third party that owns the Mark. Product Descriptions. Toppik attempts to provide accurate and updated information with respect to the Toppik products described on the Site, however, we make no guarantee that the product descriptions and information on the Site are complete, accurate, timely or free from error. Medical Information. 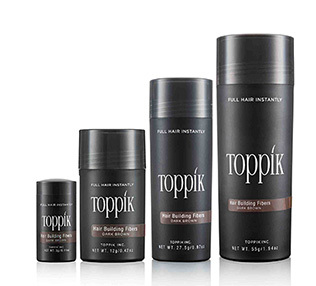 The Site contains information about the Toppik products, and various hair and skin conditions. However, this information is meant for informational purposes only and is not meant to act as a substitute for advice provided by a physician or other qualified healthcare professional. Such content does not cover all possible uses, precautions, side effects and interactions, and should not be construed to indicate that any product is safe for you. Proper treatment of any condition depends on a variety of personal health factors, and can best be assessed by a physician. Third Party Websites and Links. We may provide links to external, third party websites on the Site. Such links are provided merely as a convenience to you and do not in any way constitute or imply our endorsement, or recommendation of the third party, its information, products or services. Similarly, this Site may be accessible from third party links over which we have no control. Access to or from such websites are strictly at your own risk and subject to the terms of those websites. We recommend that you review the terms and policies applicable to those websites prior to your use. We make no warranties or representations of any kind as to the accuracy or completeness of any information contained in such websites and shall have no liability for any damages or injuries of any kind arising from such content or information. We reserve the right to add, change or remove any link at any time. NEITHER TOPPIK NOR ITS AFFILIATES OR ANY OF THEIR RESPECTIVE DIRECTORS, OFFICERS, EMPLOYEES OR AGENTS MAKES ANY WARRANTY OF ANY KIND, INCLUDING, BUT NOT LIMITED TO, ANY WARRANTY THAT CONTENT OR INFORMATION ON THE SITE IS ACCURATE OR RELIABLE, AS TO THE QUALITY OF ANY PRODUCTS DESCRIBED ON THE SITE, OR THAT THE SITE WILL BE ERROR FREE OR UNINTERRUPTED. ALL INFORMATION PROVIDED ON THIS WEB SITE IS PROVIDED "AS IS" WITHOUT WARRANTY OF ANY KIND, EITHER EXPRESSED OR IMPLIED, INCLUDING, BUT NOT LIMITED TO, THE IMPLIED WARRANTIES OF MERCHANTABILITY, FITNESS FOR A PARTICULAR PURPOSE, OR NON-INFRINGEMENT OF INTELLECTUAL PROPERTY. ALL MEDICAL CONTENT PROVIDED IN ANY AREA OF THIS SITE, IS FOR EDUCATIONAL PURPOSES ONLY. IT IS NOT INTENDED, AND SHOULD NOT BE USED, AS A SUBSTITUTE FOR THE DIAGNOSIS, TREATMENT AND ADVICE OF A PHYSICIAN. IT DOES NOT COVER ALL POSSIBLE USES, PRECAUTIONS, SIDE EFFECTS AND INTERACTIONS. IT MAY NOT CONTAIN ALL INFORMATION THAT IS APPLICABLE TO YOUR PERSONAL CIRCUMSTANCES. YOU ACKNOWLEDGE BY YOUR USE OF THIS SITE THAT TOPPIK AND ITS AFFILIATES AND AGENTS ASSUME NO RESPONSIBILITY FOR ANY CONSEQUENCE, DAMAGE OR LOSS RELATING DIRECTLY OR INDIRECTLY TO ANY ACTION OR INACTION YOU TAKE BASED ON THE INFORMATION, SERVICES, OR OTHER MATERIAL ON THIS SITE. YOUR USE OF THIS SITE IS SUBJECT TO THE ADDITIONAL DISCLAIMERS AND CAVEATS THAT MAY APPEAR THROUGHOUT THE SITE. TO THE EXTENT PERMITTED BY APPLICABLE LAW, IN NO EVENT SHALL TOPPIK, OR ANY OF ITS AFFILIATES, OR ANY OF THEIR RESPECTIVE DIRECTORS, OFFICERS, EMPLOYEES OR AGENTS, BE LIABLE TO ANY PERSON FOR ANY GENERAL, DIRECT, SPECIAL, INCIDENTAL, INDIRECT OR CONSEQUENTIAL DAMAGES, INCLUDING, WITHOUT LIMITATION, DAMAGES RESULTING FROM USE OF OR RELIANCE ON THE INFORMATION PRESENTED, LOSS OF PROFITS OR REVENUES OR COSTS OF REPLACEMENT GOODS, WHETHER IN AN ACTION OF CONTRACT, NEGLIGENCE, TORT OR OTHERWISE, ARISING OUT OF OR IN CONNECTION WITH THE USE OF OUR WEB SITE OR ANY HYPERLINKED SITE, EVEN IF TOPPIK HAS BEEN INFORMED IN ADVANCE OF THE POSSIBILITY OF SUCH DAMAGES. CERTAIN STATE LAWS DO NOT ALLOW LIMITATIONS ON IMPLIED WARRANTIES OR THE EXCLUSION OR LIMITATION OF CERTAIN DAMAGES. IF THESE LAWS APPLY TO YOU, IN SUCH STATES OUR LIABILITY WILL BE LIMITED TO THE EXTENT PERMITTED BY LAW. Effective as of October 2014.